The County Council met on Tuesday to review legislation, including presentation of legislation to allow the creation of a Food Truck Hub at Iverson Mall. The Council passed the Resolution Concerning the Fiscal Year 2019 Annual Action Plan for Housing and Community Development and a Resolution Concerning Bike to Work Day 2018. On May 18, 2018, the County will not only participate in Bike to Work Day, but will launch the first of several Capital Bikeshare stations across the County. The County Council presented the legislative package for the Zoning Ordinance Rewrite last week. Several work sessions will be held in Committee of the Whole. Residents are encouraged to provide feedback during the first work session scheduled for Monday, May 14th at 7:00 p.m. Visit the Council’s Zoning Ordinance Rewrite Portal, and learn more about the Zoning Ordinance Rewrite, legislative process, work sessions, and more. Additional information on future work sessions will be posted soon. Please check the website for updates. The County Council is in the homestretch of the Fiscal Year 2019 Budget Review Process, which began in March. In addition to Tuesday evening’s budget public hearing, several committee work sessions were held this week. The final budget public hearing is scheduled for Monday, May 7th at 7:00 p.m., in the Council Hearing Room, First Floor, County Administration Building, 14741 Gov. Oden Bowie Dr., in Upper Marlboro. Residents are encouraged to testify. Learn more, visit the Council’s FY 2019 Budget Portal. The Council met Tuesday, as the Committee of the Whole, to review the Maryland-National Capital Park and Planning Commission (M-NCPPC) Fiscal Year 2019 Operating Budget and Capital Improvement Plan and to review the Local Impact Grant Fund Multi-Year Plan. The Council’s Public Safety and Fiscal Management Committee met Monday, April 30, Wednesday, May 2, and Thursday, May 3, to review the proposed budgets for the Prince George’s County Fire Department, Volunteer Fire Department, Revenue Authority, Police Department, Non-Departmental budget items, Office of Information Technology, Office of the State’s Attorney, Homeland Security and Central Services. 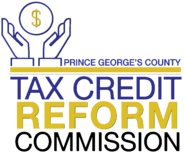 In February 2018, the Tax Credit Reform Commission was established by Council Resolution CR-009-2018, to review and analyze all existing and proposed tax credits in the County to determine the tax credit’s effectiveness, utilization, and efficacy in the County, and to recommend reform of the tax credit policy based on its review and deliberations. On April 25th, Council Vice Chair Todd Turner offered remarks on behalf of the County Council during the 41st Annual Prince George's County Public Safety Valor Awards luncheon. Prince George’s County recognized outstanding public safety men and women for acts of valor during 2017, including Captain Jonathan Morgan, the Washington National Guard pilot that directed his disabled plane to avoid damage last year. Council Member Andrea C. Harrison, Board Member, and past president of the National Organization of Black County Officials (NOBCO), welcomes NOBCO, the coalition of black elected and appointed officials within county government throughout the United States, to Prince George’s County for its 34th Annual Economic Development Conference “Counties Connected Beyond Boundaries: How Regionalism Is Rewarding.” The 2018 conference takes place from Wednesday, May 2nd through Sunday, May 6th at the Greenbelt Marriott in Greenbelt, Maryland. Congratulations to Council Member Derrick Leon Davis, who received the Mission of Love Charities, Inc. “Candle of Service Award” on Thursday, May 3, during the 14TH Annual Decatur “Bucky” Trotter Humanitarian Awards reception, hosted at Newton White Mansion. Council Member Davis remarked upon accepting the award, “Service to our communities is what we celebrate tonight, and I look forward to continuing that work with each of you.” The “Candle of Service Award” promotes substantial volunteer efforts in the community. The award read, “For Outstanding Service and Contributions in Benefit of Our Communities in Prince George’s County, Maryland.